I have a lot of favorite shows, and a lot of them are animated. But my current number one out of all of those is Rick and Morty, a hysterical ode to all the best genres. The first episode of the third season hit on April Fool's Day, but the full season won't begin until July. The wait is killing me. While the show has been a huge hit with the nerd crowd over the last couple years, it's taken awhile to get merchandise. Of course, now it's flooding in. Funko is leading the way with a variety of products, including Pop! vinyl figures and mini figures, and a line of action figures unlike most of their other work. I'm covering wave 1 tonight, which includes Rick, Morty, Mr. Poopybutthole, Birdperson, and Mr. Meeseeks. Buy all five and you can build Snowball in his robot armor. These are popping up at mass retailers first, and I found my set at the local Target. You can get them at most online retailers as well, where they'll run you around $12 each. I like the graphics and design of these cards. They went with a pretty standard 'Rick and Morty coming through a portal' background, and they've added in the Schrodinger's cats, which seems to be a common theme with the merchandise right now. This is NOT collector friendly packaging. You'll have to cut or tear the bubble off the card to get them open. While that's not ideal, it's understandable. One of the positive aspects is inside the bubble - the plastic tray actually has another plastic cover over it, removing the need for twisties. Before we start, here's a refresher on the look of the characters in question. 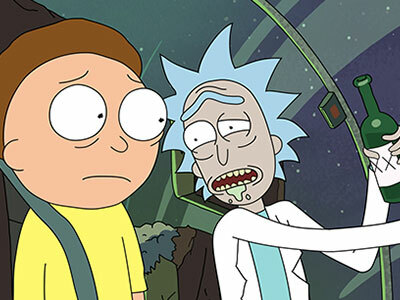 This is Rick of course, then there's his grandson Morty and his Rick's best friend Birdperson. Mr. Meeseeks was only in one episode, but there were a lot of him. 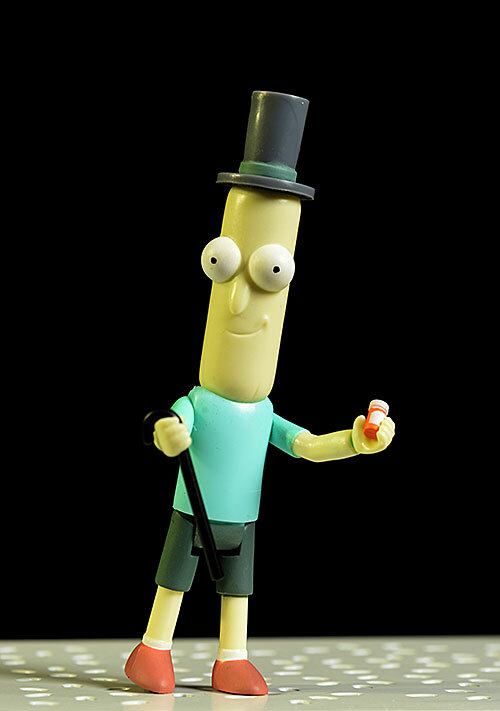 Mr. Poopybutthole has had a bit more play but is still a serious B character, and the BAF is Snowball, another relatively minor but very famous character from the first season. I've talked about this before - people assume it's easy to create figures based on cartoons. They aren't detailed, they aren't complicated...they're just cartoons! How hard can it be? Very. The look of a character shifts constantly, even from cell to cell, and going from two dimensions to three is always a major challenge for a flat image. Just because it's a cartoon, doesn't mean it's a given that the figures will be easy or perfect. Out of the entire wave, I have to say that Snowball in his armor is my favorite. You obviously get one piece with each of the other five figures, and snap them together to create the BAF. The scale's off, with him coming in at just 3 1/2" tall (the smallest of the six). Of course, it's always hard to be sure, since these things change from scene to scene in most animated shows. 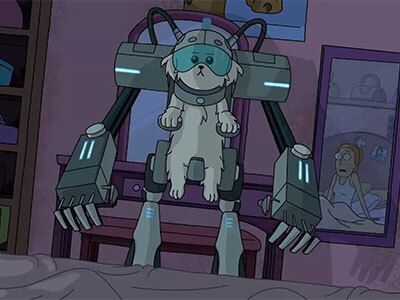 Here, when he's standing on Summer's bed ("Summer, where are my testicles?") he looks quite small. But when we see him with Morty, Snowball is generally taller than his beloved 'pet'. Here's a great group shot for comparison, and you can see he's certainly not shorter than Morty. Ignoring scale issues, the sculpt is solid. I like the amount of detail, and it matches with the on screen look. It's perhaps unfortunate that you have to buy the whole wave to get the best figure, but you wanted them all anyway, right? 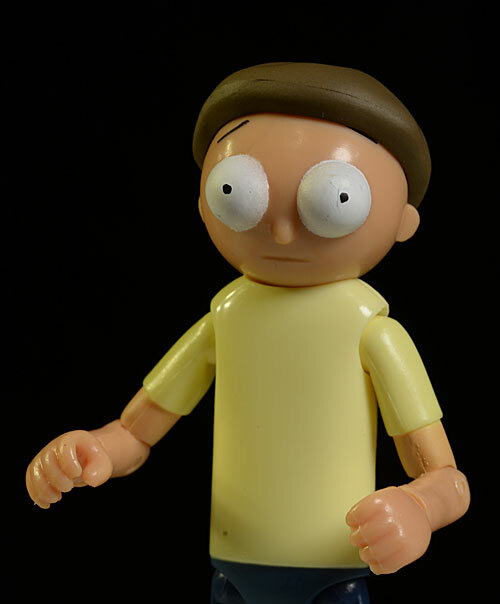 Morty is on the opposite end of that spectrum, and I'm really not feeling this figure at all. Standing 4 1/2" tall, scale is pretty God awful. He's way too big, standing well above Rick's shoulder, and he's too bulky, thicker than Rick. Snowball's size wouldn't be as much of an issue if they'd gotten Morty somewhere in the general neighborhood, but he's not even in the right zip code. On top of that, the sculpt is weak. The hair is almost entirely featureless, looking like a brown cap smacked on his head. It even covers one of his eyebrows, implying that it isn't attached correctly. I'll admit, the hair is pretty damn featureless on the show too, but since it sits back further on the head, it looks less 'hat-like'. Then there's the issue of the neck. He doesn't really have a neck on the show, and they tried to replicate that here. This is a REALLY difficult thing to translate into three dimensions. The problem is simple - with a flat image, the head and chin can cover the shoulders and neck. Translated to an action figure, and it looks like the head is sitting down inside the shirt, rather than over it. This is a common problem, and there's no easy solution. Still, it doesn't work for me. Add in eyes that seem too big, a nose that seems to small, and the overall look of this figure is a big disappointment. Poopybutthole comes in at 4 1/4"...and that's another figure where the scale is waaaay off. He's much too big, creating a weird look with the rest of the line. The basic sculpt and design of the figure on its own is fine, but when paired with the other characters the scale issues are glaring. In between, we have Birdperson (standing 5 1/4"), Mr. Meeseeks (standing 5"), and Rick himself (the tallest at 5 1/2" thanks to his spiky hair). All three of these are much better. I still have some issues with their ability to capture the actual look, but it's close enough for me. 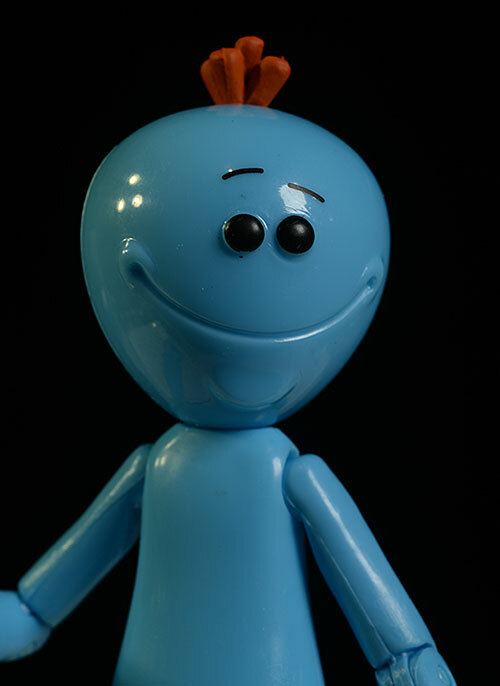 I particularly like the way Meeseeks came out, with a slightly stylized take on the design. In the very last photo, you'll get a shot of all of them together so you can compare scale yourself. 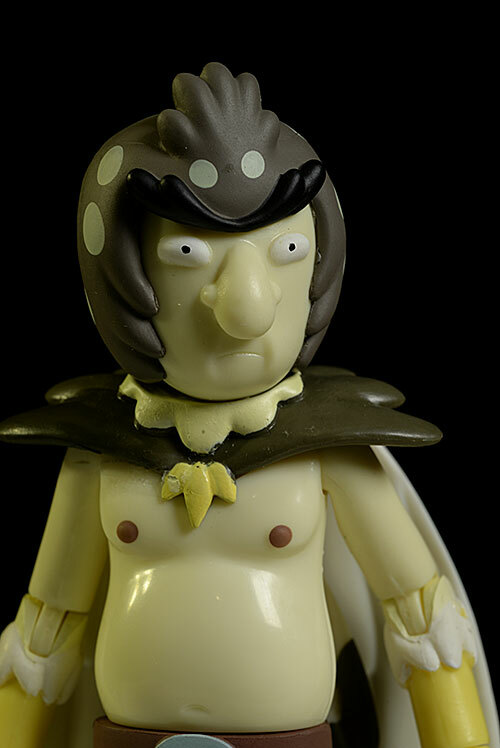 The paint quality is pretty sloppy all across the board, but Morty is the worst of the bunch. The white eyes have poor edges, and the black pupils are a tad googley. Worse, the hair is aligned on top of the head too far forward, almost completely covering one eyebrow. In hand, you can't even see the left brow, giving him a really freaky look. The other five are certainly better than that, but they still all have quality issues. 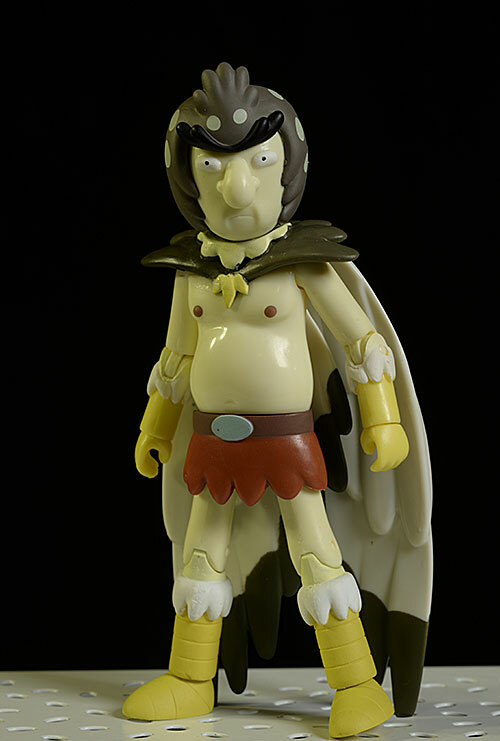 Birdperson has the most detail, and he has the most slop, especially around the cape and collar. 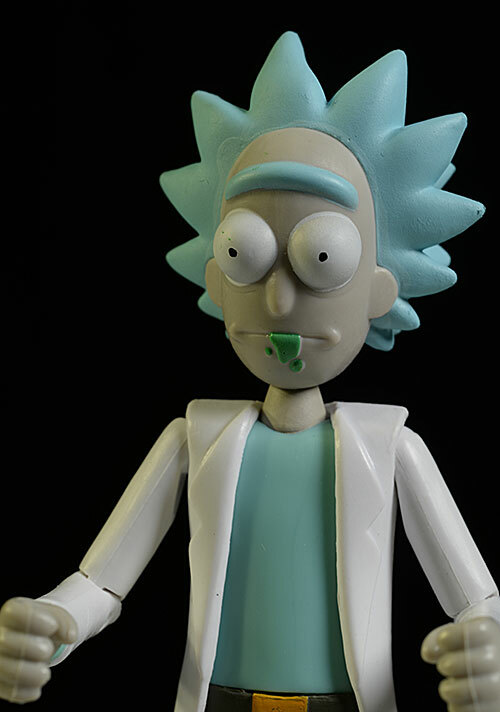 Rick's eyes are pretty bad, and even a figure as simple as Poopybutthole ends up with poor cut lines. Mr. Meeseeks *almost* managed a higher score...but he has such a high gloss on the plastic that it clashes with the rest of the line. At least his overall quality is better. These figures have more articulation than most Funko figures in any scale, particularly the ReAction stuff, but even the new 9POA line. There's a ball jointed neck, rotating hinge shoulders and hips, pin elbows and knees, and cut wrists and ankles. That's the standard stuff, with a couple of the figures varying from there. For example, Birdperson adds in the articulated wings that can fold down behind his back, or move out in a flight position. Going the other way, Mr. Poopybutthole has just the cut neck, cut shoulders, cut wrists, and simple T hips. Here's the problem - there's plenty of joints, but they're terrible. Getting the figures to stand is a problem, even in simple poses. The hips are really weird, with the rotating hinges combined with an odd V cut design. As you turn the hip, you feel it 'pop', and I was constantly worried about breaking one. Color me unimpressed. 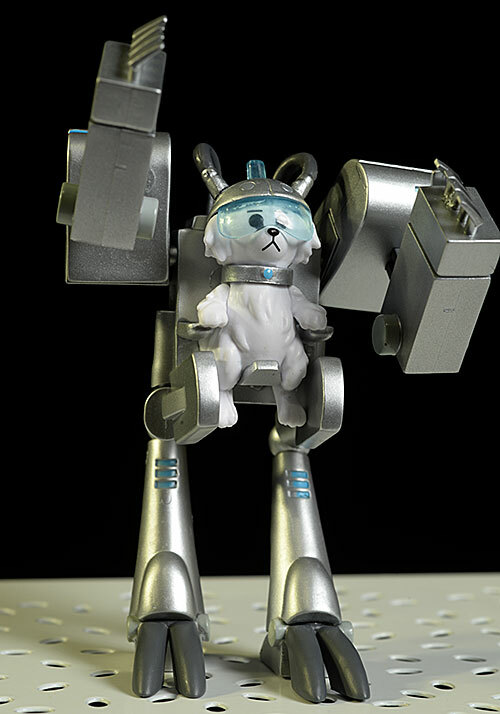 As mentioned, each figure comes with a piece of Snowball in the robot mobility suit. 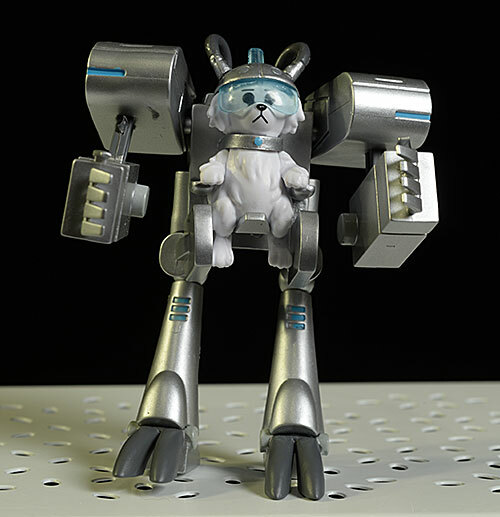 Snowball himself is an accessory, and while BAF's sometime come with their own accessories, it's very rare. I won't be holding it against Snowball. 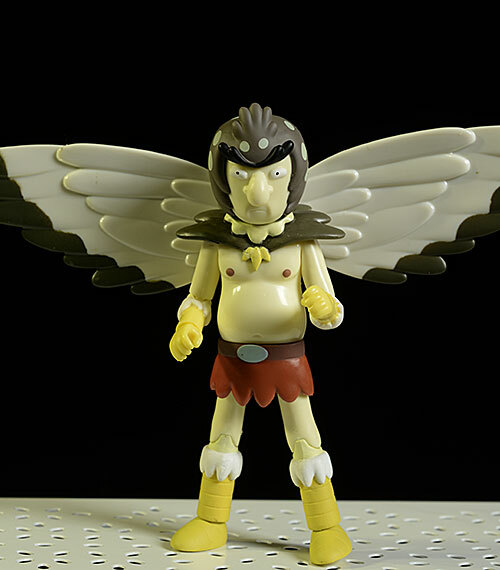 Birdperson only has the BAF piece, so he gets the base average of **1/2. 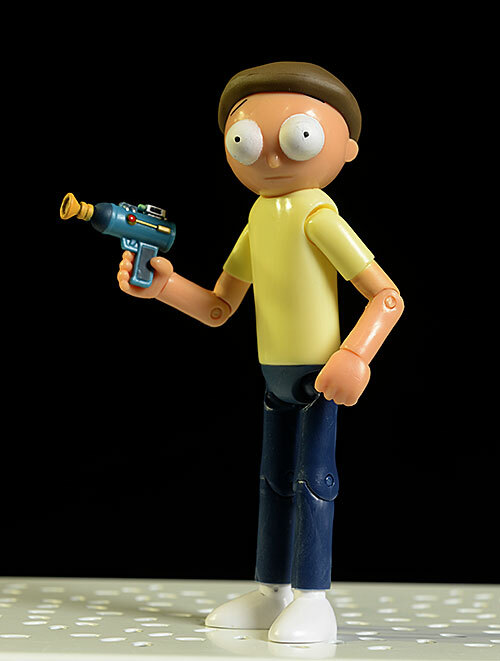 Morty comes with one additional extra - the blaster he's used on several occasions on the show. If I'm not mistaken, it's the one Beth shoots Poopybutthole with...but I'm going off memory here. It fits in his hand, and has a reasonable cartoon sculpt and paint job. Speaking of Mr. Poopybutthole, he comes with two accessories very specific to his short appearance in a episode bumper. In this shot, he's recovered from his wounds, but requires a cane and pain pills. The figure includes the cane and the small pill bottle. Again, these fit in the hands neatly. 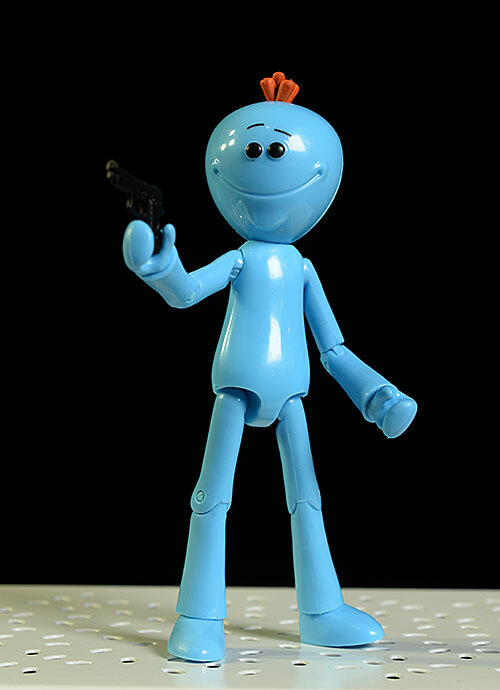 Likewise, Meeseeks comes with very episode specific extras: a golf club and a handgun. While both make perfect sense with this character, they'll make even better sense when we have a Jerry to go with him. Finally, there's Rick. He has his portal gun and a small, silver flask. 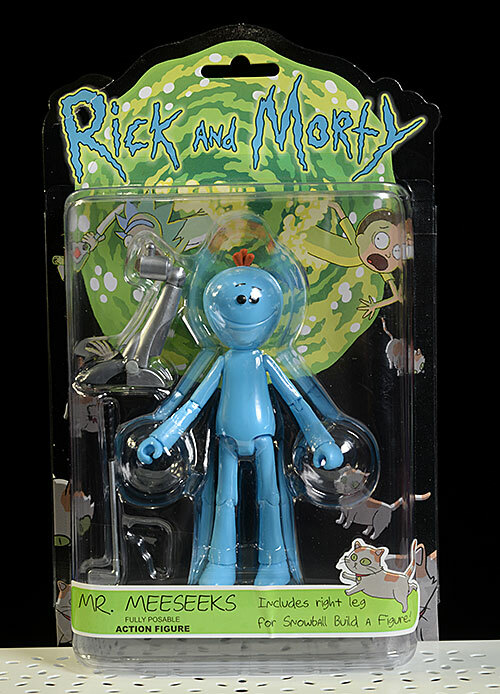 Again, both fit in his hands nicely, and while the detail work on the portal gun is a bit wanting, it's still a reasonably good facsimile. The wonky articulation hurts them here. You can get sitting poses, but getting good standing poses is frustrating, and frustration is never conducive to 'fun'. At $12 each, these aren't cheap, even for 5" scale figure. But it's more of an issue of the figure quality for the price point, and the paint, sculpt and articulation just aren't where they need to be to command this much cash. Trying to work with the hips was freaking me out. I thought I was going to break something for sure. I didn't, but I'd be very careful when working with them. I had pretty high hopes for these, and it's been awhile since we got a truly amazing cartoon line. Sadly, this isn't one. 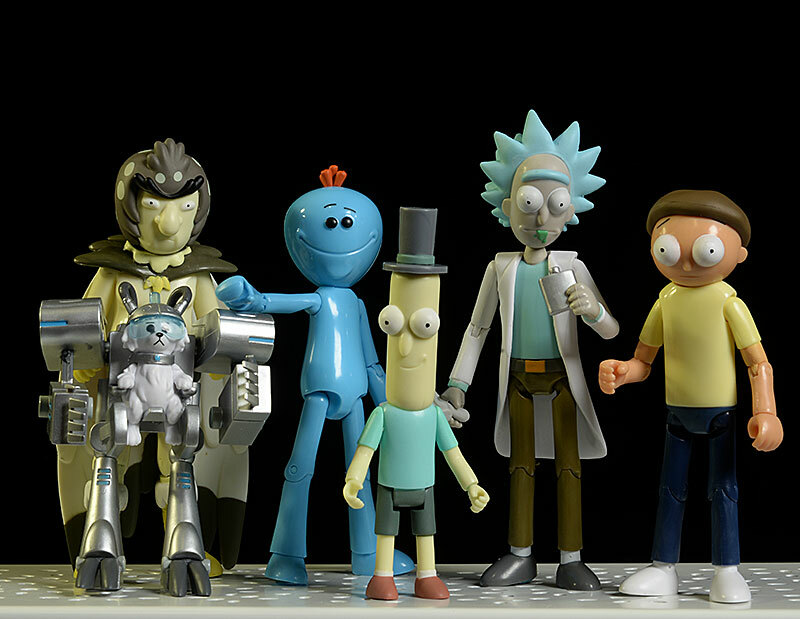 To be fair, the only truly awful figure in the group is Morty. The problem is he's one half of the title of the show - getting him right is pretty critical to the whole line. My favorite overall is clear - Snowball. I can live with Rick, Meeseeks, and Birdperson, and I'm hoping we see the paint quality improve on any future waves. And that's why I always say, "shum-shum-schlippety-dop!" - has the single figures for 12 each. - Entertainment Earth has the singles for $12 each as well. 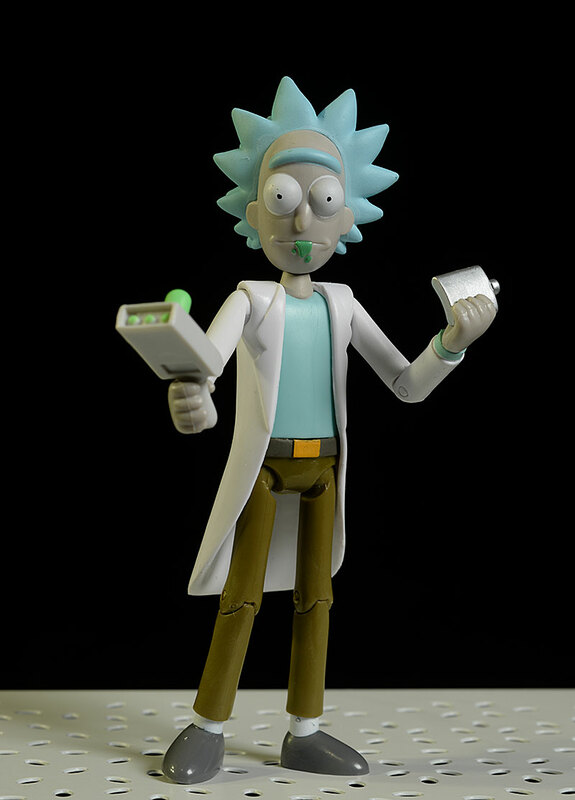 This is the first Rick and Morty stuff I've covered, but I'll be hitting up the construction sets from McFarlane once they are released.